Unable to use the data service on your phone? Here are some steps you can take to get it working again. Step 1. 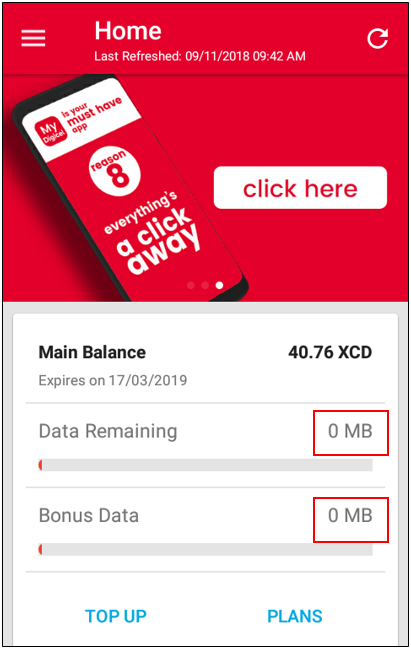 Confirm that you still have data available on your account by checking your data balance using the My Digicel App or dialing *141#. Step 2. If there are no MB available, please try activating a plan by dialing a short code from your phone, using the My Digicel App or dialing *141#. Is your MB balance less than you expected? For help to understand how different activities use different amounts of data, click here. Step 3. If data is available, try accessing a Google web page or web-enabled app. This will help confirm if the issue you are experiencing relates to a particular app, or to the entire internet service. Step 4. If some websites/apps work, the issue you were experiencing may have been a temporary issue, or the problem may be related to one particular app. We suggest restarting the application and trying again. Example: WhatsApp is working, but the browser is offline. Step 5. If all websites or apps do not work, please check your APN settings. Step 6. Check that your mobile data connection has been enabled. You can confirm this by going to settings, then data usage. You will then see the option to have your data turned on/off. If your phone has the drop down menu option, you may also enable your mobile data from there. Step 7. If you have done all of the above and you find more than one person experiencing the same challenge, it may be a network issue. We assure you that we are working diligently to resolve this at the soonest possible time and so, we urge that you try the service later. If you realize that you are still experiencing the issue, you can use the live chat option so we can have the matter investigated further for you.